Presteigne Reserves’ scheduled Mid Wales League (South) fixture against Penybont United on Tuesday, 9 April has been postponed. Given the amount of rain that has fallen on ‘Stadio Llanandras’ in the past 48 hours or so, this won’t come as a major surprise to anyone living in the LD8 postcode. 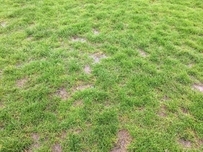 Club officials flagged up this morning that there could be a potential issue with the pitch and an inspection this afternoon has confirmed their worst fears. But there is a chance the game could now take place on Wednesday, 10 April. Penybont United are going to check they can raise a side for that night but, given we are now getting on in the season, both sides are reportedly keen to get it played as soon as possible. Presteigne Reserves will be especially keen to get a game in ahead of their Pip Samuel (Electrical) Mid Wales League (South) Cup semi-final at Llanidloes Town on Saturday, 13 April. We will confirm the details of the rearranged fixture against ‘The Bont’ just as soon as have them.